Letter to a dear friend who is in a difficult situation. Arjuna's dilemma.... What does Krishna want me to do? I thought of a couple more things to share on the subject we were discussing Sunday afternoon. The Gita's message... performing one's duty for Krishna even if it is distasteful materially. I probably told you I saw to my father's care for about seven years before coming to Alachua in late 2017. I loved him dearly. He was more fun than a barrel of monkeys. Everyone that met him loved him. I was so grateful to be able to be with him and see to his care as he became unable to manage for himself. I was honored that he accepted my humble to attempts to help him. Although I am sure I got in the way more than helping but there was no one else, my brother passed away, my mother was also gone. So it came down to me. I struggled at first because this was more responsibility than I had ever be faced with. Living alone as I had been doing and living very simply. At one point we were living in his house in South Florida. He was ninety-four and I tried to make it work hiring a nurse to come during the week to attend to him in ways I couldn't do since I was his daughter. He was a trip even when he was a young man and at 94 it was more than outrageous the things he would get into. Like insisting on taking a bath going into the bathroom and locking the door? Then not being able to get out of the bathtub. There were hundreds of coo coo things that he would do. I loved him so I was able somehow or other to get the needful done. But a big problem was his food. He was a BIG meat-eater. All three meals and even snacks had to be meat, fish or eggs. I found myself in a difficult situation. I had to prepare his meals. At first, I was horrified. I had nightmares and the house would smell of cooked animals. But I didn't see a way out of it. He refused to eat without meat. Getting make-believe meat products didn't work. He couldn't digest soy very well and could tell the difference. I surrendered to cooking for him not in anger or resentment but in love. And prayed to Krishna to help me. Krishna made an arrangement to rescue me. My father insisted on taking a walk. It was very hot and I tried to stop him but he was also very stubborn. So I went with him and sure enough, a block away from his house he lost his balance and fell on the sidewalk. I tried to catch him but it wasn't enough. He still fell with the weight of his body on his head. He was admitted to the hospital for tests and then sent to a rehabilitation center. He was there for a month. I made arrangements for him to live in the nicest assisted living housing that I could find. It was a very active place. Movies, entertainment, social life and he could eat all the meat he wanted. Krishna's arrangement. I was so thankful. So sometimes it is like that. I might have to do something I don't want to do. The experience was very purifying for me. It helped to crush some of my false pride of "being a devotee." It helped me to see how a devotee can be in any mode. Not just the brahminical mode of goodness. I think that is why I like Mahabharata so much. It's not a "Brahmana" thing. It's a devotee, Vaishnava, thing. The other thoughts that crossed my mind center on the story about the two monks who were traveling together and came to the bank of a river and were about to cross. There was an older woman at the edge of the river also and she was crying. She needed to get across the river having heard that her daughter who lived on the other side was sick But the woman couldn't swim and the current was very strong. 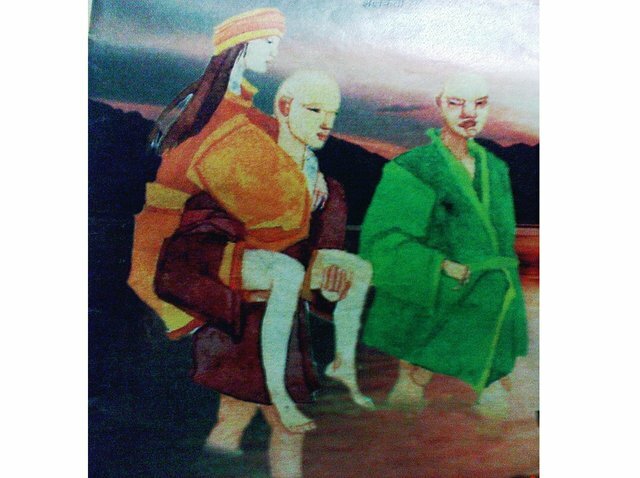 One of the monks picked her up and put her on his shoulders and carried her across. The other monk was in shock. And as they continued on their journey after they left the woman he spoke constantly, "How could you do that? You know we are not supposed to have any contact with women and you picked her up and carried her. I just don't see how you could have done that." He kept complaining like that for quite some time. Finally, the other monk told him, "Yes. I picked her up and carried her across the river. But I put her down. You are still carrying her." One of my favorites. So sometimes I might have to do something I don't want to do. But if it is my duty then I do it and when the situation changes I move on. Krishna makes the arrangements. There is so much to discuss on this. Duty, devotion, surrender, love. I have found that the Krishna conscious course of action was not always what I thought it was.